Emory Parnell was born December 29, 1892, St. Paul, Minnesota. He played HANK HAWKINS, Riley's boss at Cunningham Aircraft. Henry "Bomber" Kulky. Henry was a champion wrestler from the 1940s, "Bomber Kulkavich". He participated in 7,000 wrestling matches. 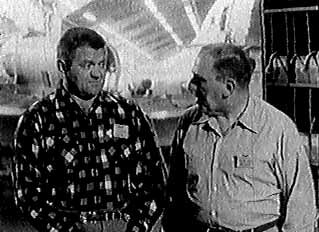 He played OTTO SCHMIDLAP, who worked with Riley and Gillis at the aircraft plant. 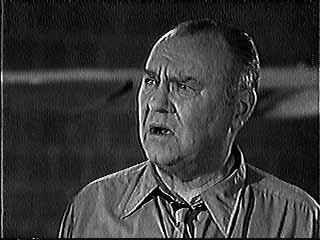 Otto had a brother Lambert, played by Benny Baker. Henry Kulky appeared in this 1956 movie, "The Girl Can't Help It". He plays a guy who has a warm reaction to Jayne Mansfield. He melted that ice in record time. Douglass Dumbrille played CYRUS CUNNINGHAM, Riley's big boss who was president of the Cunningham Aircraft Company.